This recipe is an adaptation of the technique for strawberry ice cream explored by Max Falkowitz when he was at Serious Eats. The better your berries, the better your ice cream will be. Wash, hull, and quarter 1 cup of strawberries. Slice the quarters very thinly. Place in a mixing bowl and pour 1/2 cup of the sugar and the liquor over the berries. Mix, cover, and refrigerate for at least 2 hours, and as long as 2 days. Wash, hull, and slice the remaining berries, and purée in a blender until very smooth. Strain through a fine-mesh strainer to remove the seeds, then measure out 1 1/2 cups of the strained purée. Reserve any extra for another use. Whisk the xanthan gum into the remaining 3/4 cup sugar in a large mixing bowl. Whisk in the 1 1/2 cups of purée, half & half, and corn syrup, whisking until fully combined. Add salt to taste and, if the mixture is too sweet, a few drops of fresh lemon juice. 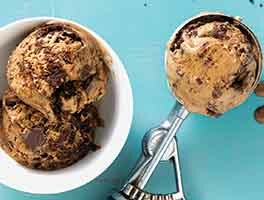 Chill the base until very cold, then freeze in an ice cream maker according to the manufacturer's instructions. 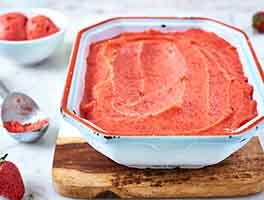 In the last minute of churning, retrieve the sliced strawberries from the refrigerator, drain the liquid, and add to the ice cream for the final few turns. 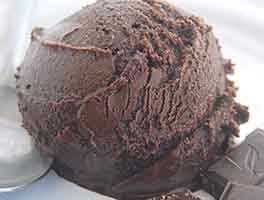 Transfer the ice cream to a covered container and freeze for 2 to 3 hours before serving. Best strawberry ice cream I've made! I didn't like that the berries turned to ice when I used other recipes, the trick of soaking them in vodka first really did the trick. This ice cream was rich, smooth, and had a strong strawberry flavor. I'll be making it every summer from now on when the strawberries are at their peak. This strawberry ice cream is fantastic! It is simple to make and delicious. 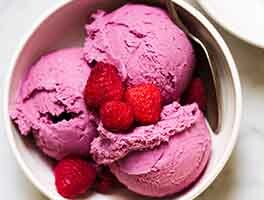 The ice cream freezes to a nice consistency, not icy and hard as a rock but perfectly easy to scoop, creamy and tasty with fresh strawberry flavors. I love it! Delicious! I will make this again for a family dinner next weekend! 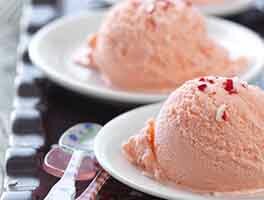 Definitely the best strawberry ice cream recipe I've found. Creamy and delicious! I had some difficulty straining out the strawberry seeds with a mesh colander but it's very much worth the trouble. I just wish it made more! Also, if I may say, the vodka drained from the strawberries was also quite tasty and makes for a delicious infusion. This is the best strawberry ice cream I have tasted. 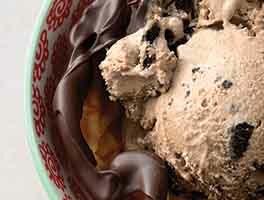 I did not have then xanthan gum (the Serious Eats version does not have it), so I didn't add it, and it was perfect. This is perfectly creamy but is still light. Wish I knew whether this would work with other berries such as blueberries or raspberries.